Application Title The application title is inserted between "ImageLab" and the version number as it is displayed in the caption of the main window. The application title is also displayed in the about box. Color Gradient Determines the kind of color gradient used for the background of the shortcut button bar. Display a Background Image ImageLab allows to display a logo or background image on its desktop (= background of the main window). In order to display a background image you have to check the box "Display a Background Image" and specify the background file. There are two options for adjusting the background image: "Centered Unscaled Image" displays the image in the center of the desktop without scaling it. This option is mainly for displaying logos. The other option "Aligned to Client Area" scales the image such that it fills the background area (the size of the image is adjusted to the desktop area). Background Color of the Desktop Specifies the background color of the desktop. Grid Color of the Desktop If no background image is specified, the background is rendered as a regular grid using the specified color. Save Customization Parameters This command stores the current customization parameters in a file. 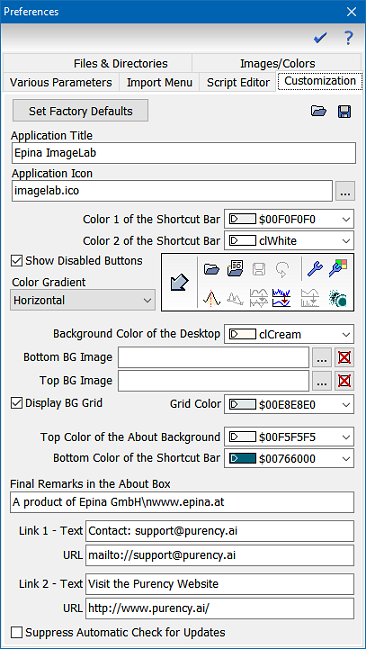 This command is for OEM customization purposes only - if you are an OEM and want to deliver ImageLab with your instrument in a customized form, please contact us for details at office@epina.at.